Peaceful, inviting, and filled with healing energy – our Meditation evenings give everyone the opportunity to share their wisdom. This wisdom, in turn, enhances our individual and collective journeys to wellness. We meditate to one of Lois’ many guided meditations, which intuitively fit the needs of the moment. Meditations on Mindfulness, Compassion, Gratitude, Ho’Oponopono, I Am, are only a few of the meditations you may experience. There are so many Benefits that individuals experience over time, with their practice of Meditation. Some of these benefits may include: Stress Reduction; Enriched Sleep; Improved Focus & Clarity; Empowerment; Quieting the Mind; healing Mind, Body, Spirit; Mindfulness; Chakra Balancing; Happiness, Contentment, Gratitude; Increased Energy; and often, so much more. Remember that Meditation is a practice that over time, helps us move closer to our Divine self. Please join us on your journey. Meditations led by Lois Boughton, Reiki Master Teacher, Transformational Coach – scheduled evenings from 7:00 p.m. to 9:00 p.m. (please check our calendar for specific dates). 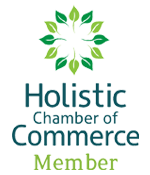 The Holistic Chamber of Commerce Chilliwack Chapter represents holistic professionals, practitioners and businesses. We encourage and promote healthy living, and support the professionals and businesses that make it possible. Each month we have a Chilliwack Chamber of Commerce member deliver a presentation about their business, ideas on improving our lifestyles, and much more. Bring your ideas on how to promote each other and holistic business in general to this meeting. Whether you are a holistic practitioner, or a support service in the community, come and share your thoughts on the business of wellness and help shape the goals and focus of your Holistic Chamber of Commerce. We always welcome guests. Members $5 Non Members $10 See you there!